Dr. William Harwood served as an American diplomat from 1977 to 1999 in Europe and Asia. He wrote his reflections on the dangers his wife, his colleagues, and he faced after the death of J. Christopher Stevens (1980-2012) from smoke inhalation during a terrorist attack on 11 September 2012 on the American embassy in Benghazi, Libya. I met Dr. Harwood in 1976 when I entered graduate school at the University of Illinois. He completed his doctorate in history in 1977 with a dissertation on Ignacy Daszyński (1866-1936), a Polish socialist politician, and then entered the Foreign Service. After a hiatus of several years, we restored our communications, and in the summer of 2012 we managed to meet in Prague. 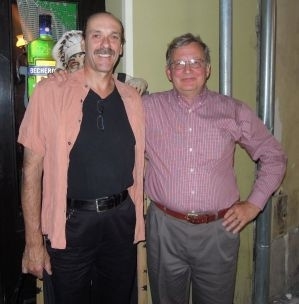 Photo: Dan Miller (left) and Bill Harwood (right) in Prague, August 2012 (photo courtesy of Elaine Harwood). News of the deaths of our Ambassador to Libya and three of his staff members brings back family memories of similar incidents my family experienced in 22 years of diplomatic service. In 1979, the last previous American ambassador killed in the line of duty, Adolph (Spike) Dubs, died in Kabul, Afghanistan. My late wife, Marjorie Harwood, was assigned to Kabul in 1977 on her first tour in the Foreign Service as a nurse for the embassy. Here is the story I told at her memorial service in September, 1999, in Maui, Hawaii. Due to her experience in hospital emergency room work, she was sent to the Kabul Hotel as the backup medical person. Our Russian-speaking American officers attempted to deal with the Russian security personnel posted in the hotel corridor outside the room where the rebels held the Ambassador. The Russians were there as advisors to the Afghan Communist regime. As the only woman on the scene, she took refuge in a women's room down the hall. It was not clear who the rebels were or what they demanded. When they lost patience with the negotiation process, the Russians told the Afghan security forces to open fire through the locked room door. They killed everyone in the room, including our ambassador. The Afghan government made no apology. She prepared his body for shipment back to Washington. All of the male American diplomats on the scene were cited for heroism. My wife got no recognition. The Carter government did nothing, as Cyrus Vance, the Secretary of State, did not want to disturb the Russians. Afghanistan played no role in international strategic considerations. In sharp contrast to 2012, there was little coverage in the American media. Nobody seemed to care except for his family and Foreign Service colleagues. Beyond this, we went through other such incidents of violence and threats to our physical safety. In Mogadishu, Somalia, in 1990, mobs rioted in the streets outside our homes as we took refuge in our interior safe havens. I was the Embassy press and cultural attache, and our daughter attended a pre-K. Later that summer, a Marine was shot in the city. A brave Somali woman employee called for a vehicle to take him to the Embassy compound, where my wife treated his wounds and arranged for his medical evacuation to Nairobi. The Somali woman was detained by the local police for two days for consorting with a foreigner. A week after arriving in Moscow in 1993, we returned from a Sunday outing to find that the Russian security personnel assigned to guard our Embassy residential compound had abandoned their posts. 300 American staff members and our families hid for three days and nights in the embassy underground living and recreation compound. Anti-government mobs had seized the Russian parliament next to our facility. The next day my wife crawled onto an embassy roof to rescue a Marine shot in the neck by a Russian sniper. She treated his wounds and took him to the Kremlin hospital. Then we watched the CNN live coverage of Russian government tanks blasting the parliament building where the rebels were barricaded inside. We felt the ground shake and heard the shells explode as the Yeltsin regime ended the standoff. Two years later in Islamabad, Pakistan, Islamic fanatics blew up the Egyptian embassy compound next to our embassy. My wife treated a woman badly cut in a shower of broken glass. Our compound has been sacked by a mob several years previously. The American media paid little attention to these incidents, which we took as part of our jobs as unarmed civilians, with our families, and not as part of the military. We had no Internet or reliable telephones, no 24-hour news cycles or satellite television. How times have changed.